The Boston Herald reports that hundreds of journalists hungry for advancement have sent in resumés to become Bob Woodward's assistant. Making up facts to fit a preestablished narrative a plus. Also, like Mark Felt, you have to do all the work but give all the credit to Woodward. Last October, Dante Chinni wrote in the Christian Science Monitor that Bob Woodward has an uncanny knack for finding quotes to match any narrative, even if it contradicts one of his earlier narratives. 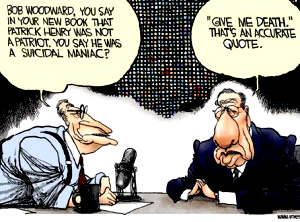 You may not be Carl Bernstein, but that doesn’t mean you can’t work with Bob Woodward. The legendary journalist is currently looking for a new assistant and took the unusual step of advertising on Web sites like journalismjobs.com. According to the ad, which was posted earlier this week, the assistant would work out of Woodward’s home office doing research and reporting on the journalist’s book projects along with handling various administrative tasks. “But I don’t want to discourage anyone from applying. I certainly didn’t come from any top papers to this job,” he said. Murphy said the job was light on administrative tasks and heavy on the reporting and research side. The job is designed to last two years or until the next book is published, whichever comes first, Murphy said. Murphy said his next job will be doing a temporary assignment in Iraq for The Washington Post and he’s also got a book deal lined up with Henry Holt and Co.